Whoa whoa whoa, I know what you’re thinking here, the Venza is very much a weird blandmobile that should never be considered by any car enthusiast for any purpose whatsoever. But I want one. I have good reasons! Hear me out. Right now, my one and only car is my modified-to-hell BMW 335xi coupe, because it’s a fun performance car that, when shod with snow tires, is pretty damn decent to drive in snowy Wisconsin winters. But I used to have both a BMW 135is and a Jeep Grand Cherokee, which I consolidated into this 335xi because having 3 cars along with my wife in our little townhouse with a 1-car garage was complicated. We’re talking about buying a house, which will have at least a 2-car garage (and maybe a 3-car if I can finagle it), which of course leads me to thoughts of going back to 2 cars for myself. I very much enjoy having a stupid fun performance car, but I also like having a nice comfy highway cruiser that can handle winter and utility duties. Plus sometimes if I’m just putzing around town I prefer to have the roomier more relaxed car so I can spread out and not get beaten up by a stiff suspension & low profile tires on crappy Wisconsin roads. My Grand Cherokee was good at serving this purpose, but it was also wayyyyy overkill for winter traction, at the expense of fuel economy and practicality. I was hung up on having as many fancy differentials as possible, and the Quadra-Drive II 4wd system on my particular Grand Cherokee had 3 Eaton EGerodisc LSDs. Combined with General Grabber AT2 all-terrain tires, it was a formidable winter vehicle. Which was great, but I don’t go off road, I just drive around Madison when it snows. Quadra-Drive II was usually available combined with the Hemi motor. Between that, the heavy A/T tires, and the old-school 5-speed automatic transmission, I averaged 11 mpg around town. I was lucky if I touched 16 mpg on the highway. Its back seat and cargo room were ok, but nothing great. The reality is, any awd car with proper winter tires and maybe some raised ground clearance is totally fine for my winter needs. So I might as well get something that’s better at the comfy cruiser type responsibilities, and is more car-like to drive, while having more room inside and better mpg. The Venza is basically a raised Camry wagon with available awd. The same thing can also be said about the Highlander, but the Venza is closer to being a regular car. It has several things I like. Let me count the ways. I actually kinda like how it looks. It’s sort of handsome, and certainly much better looking than the humpback whale Honda Crosstour. Sure, the Venza has a basic slip-n-grip fwd-based all wheel drive system, but combined with some good winter tires and its semi-raised ride height, it’s perfectly acceptable for my needs in winter. It’s not as if I need to be able to get around town in every snowstorm at all costs, I just want to have above-average winter capability. The transverse engine layout makes for a more roomy interior. The step-up engine is a more-than-capable 3.5 liter, 268 hp V6 that along with a pretty decent 6-speed automatic transmission and the awd system, averages 18/21/25 city/mixed/highway mpg on regular gas. The inside isn’t super-premium, but the higher-spec XLE and Limited trims are a pretty nice place to be. The tan color has a black dash top and carpets like the automotive deities intended, and a double sunroof! There’s a phone nook in the dash! I’m not sure if it’s wide enough for today’s big-screen phones, but points for effort. Look at all this room for random furniture my wife will hypothetically buy from garage sales and thrift stores then refinish, but probably not actually buy or refinish! Now here’s the kicker. The stereo isn’t quite a standard double-DIN opening, but it’s close, and there’s a dash kit that does a pretty decent job of integrating double-DIN head units. So I could swap out the head unit for something that supports Android Auto, while still being able to interface with backup cameras and reuse the pretty dang decent factory JBL amp and speakers. The only wiring that’s not readily available through an adapter is the factory USB port but I’m sure there’s some way to re-use the factory USB/aux port panel location with an aftermarket head unit. 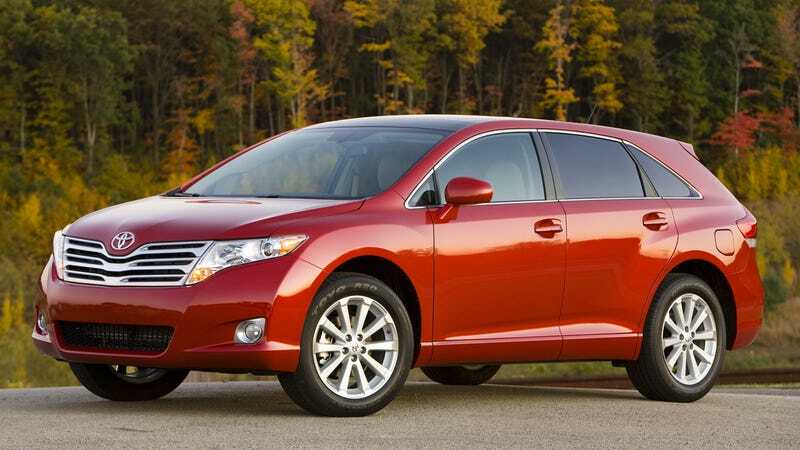 Is the Venza a high performance machine? No, of course not. But it’s got better-than-econobox quickness, plenty of comfort and room, enough winter traction to realistically meet my needs, and can be easily brought up to current in-car tech levels. It’s still lower to the ground than other crossovers, and drives more like a car, even if that car is a boring Camry. It’ll be cheap to insure and maintain, and at least halfway decent on gas. I’m pretty sure I’ve found my next comfy cruiser winter vehicle, for whenever it is I might be able to go back to 2 cars. At least until I change my mind 43 more times between now and when I can actually get the 2 cars. My wife will be so proud of me.